While you may have heard of Sasquatch, the large and hairy humanoid creature that walks on its hind legs, a new breed of Bigfoot has been discovered in Western Massachusetts: Pot Sasquatch. A person dressed as a ginormous nugget of weed had a great time trolling WWLP meteorologist Jennifer Pagliei during her coverage of the winter storm which plowed through the northeastern United States on Thursday. 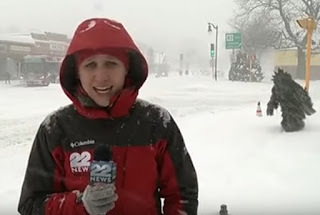 Just as Pagliei started to deliver her live update, the Pot Sasquatch creeped into the shot, surprising her when she turned around to show off the snowfall.